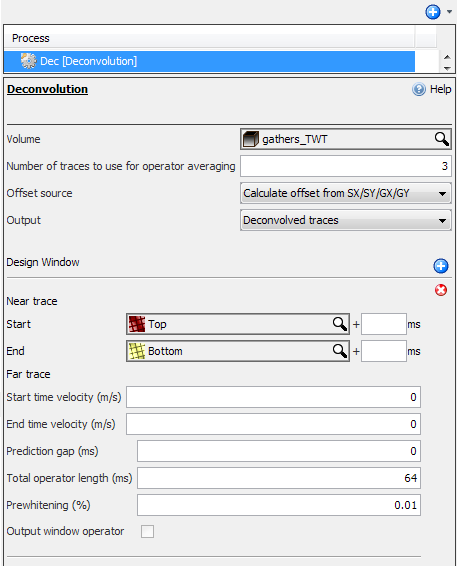 Description Apply deconvolution to a volume over specified windows. Deconvolution compresses the basic wavelet in the recorded seismogram, attenuates reverberations and short-period multiples, thus increases temporal resolution and yields a representation of subsurface reflectivity. This process is only available for pre-stack data. Double-click Deconvolution, type a name for the process and click OK. Number of traces to use for operator averaging — The deconvolution operator in each design window is averaged over the specified number of adjacent traces. Offset source — Select whether offset should be taken from the OFFSET header, or calculated from SX/SY/GX/GY headers. Output — Select whether to output the deconvolved trace (the unpredictable part), the predictable part of the signal, or the operator. When the operator is output, "Output window operator" must be selected in exactly one design window. A window model must be defined before deconvolution can be run. Add a Design Window by clicking the Add icon. Start — The start time (or horizon) for the current design window. End — The end time (or horizon) for the current design window. Start time velocity (m/s) — The velocity to use to droop the start time with offset. If this value is zero, the start of the design window is flat with offset. End time velocity (m/s) — The velocity to use to droop the end time with offset. If this value is zero, the end of the design window is flat with offset. Prediction gap (ms) — Prediction gap for the current design window. Total operator length (ms) — This is the total length of the filter (prediction gap + operator length) for the current design window. Prewhitening (%) — The percentage prewhitening for the current design window. Output window operator — Select this to output the operator for the current design window. This is only available when "Operator from selected window" is selected for Output. Only one design window operator can be output. The end time for a design window must be greater (deeper) than the start time. If horizons are used, the horizon must cover the entire input data, and start and end horizons must not cross. If start or end time velocity is used, the final drooped start and end times must satisfy this condition. When multiple design windows are used, the operator for the top window is applied from the beginning of the trace. Likewise the operator from the deepest window is applied to the end of the trace. If two adjacent windows do not overlap, both operators are used in the area between the windows, with a linear taper applied to each. Likewise, if two windows overlap, both operators are used with a linear ramp across the entire overlap area.